Your minutes allowance includes calls to UK landlines (beginning 01, 02 and 03) and calls and texts to UK mobiles. Calls to service numbers (084, 087, 09 and 118) and personal numbers (070) are not included, other exclusions apply - see terms and conditions. To find out how much you’ll pay for calls, texts and data and what is/ isn’t included in your plan, please take a look at our call charges. Trust me and go ID instead. I think you can get 8gb + rollover with them. I was with virgin for years due to the cheap price, but the service was so bad I ended up leaving to ID, and they are miles and miles ahead. BTW, I'm not a Virgin hater, I have their tv/broadband, but stay well clear of their mobile. Same as my wife. No change in price and still cheap. Virgin no worse than …Same as my wife. No change in price and still cheap. Virgin no worse than anyone else. Customer service is not great. To me, all customer service is bad, irrespective of provider, so I laugh when people on here leave one to join another thinking service will be amazing. Cold. All data in your account but no data when you need it due to low priority and missing bands on EE network. If your phone does not work, you can proudly say you joined Virgin mobile. Trust me and go ID instead. I think you can get 8gb + rollover with them.I …Trust me and go ID instead. I think you can get 8gb + rollover with them.I was with virgin for years due to the cheap price, but the service was so bad I ended up leaving to ID, and they are miles and miles ahead. BTW, I'm not a Virgin hater, I have their tv/broadband, but stay well clear of their mobile. how long has ID been around for? Virgin mobile have increased my £8 bill by £4. Rang them yesterday and they are offering me nothing less than £12. I only need about 4gb data and even some of that gets rolled over. how long has ID been around for? 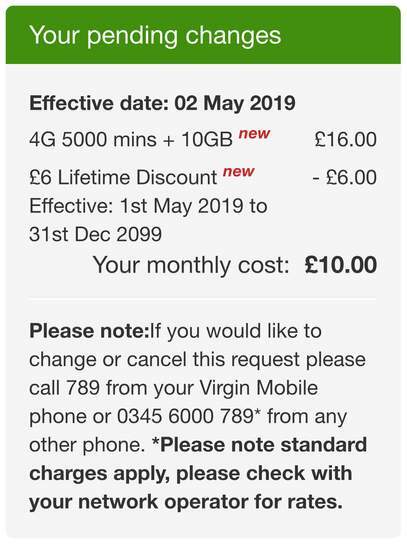 Virgin mobile have increased my £8 bill …how long has ID been around for? Virgin mobile have increased my £8 bill by £4. Rang them yesterday and they are offering me nothing less than £12. I only need about 4gb data and even some of that gets rolled over. That's really good. I did haggle with them and was on the phone for ages but didn't budge. For this price I’d go with Voxi as they do free data for social media platforms. I joined ID (owned by Carphonewarehouse) about 3 or 4 years ago from Virgin, and I have just switched to 3 (whom ID use to privide their service). They cost me a few pounds more each month but after the problems I had with Virgin mobile, it was worth double/treble that. 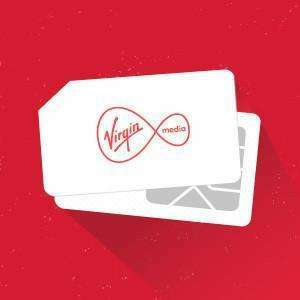 Let's put it this way, if virgin offered me this free to switch to them, I honestly wouldn't take it, as I value receiving my calls when people call, not a voicemail message notification several hours after the call was made, even when I had full signal, connected to WiFi and not using my phone! I did not have a problem with their Phillipines call center but their fake 4G network which made my latest Samsung phone into 2G voice only phone. Can you cap your spend with ID? Do they have iOS app? Yes you can and yes they do. I switched yesterday to iD from virgin. The rep when I phoned to cancel would not offer anything near this deal. I get the train into work and regularly have 5 mins of black spots due to their network, call up to change something in my account twice and it was still not changed, had calls go straight to answerphone with full signal at home and so on. Good riddance as far as I am concerned! ive just been put on this deal as last deal went from £15 to £19 like overnight. my data was 20gb plus rollover but only using like 10-15gb average. so i think 10gb plus rollover is fine for me and got bt wifi hotspots etc. ive been with virgin for like 4 years i think. i think there service is just fine, better the devil you know as they say. 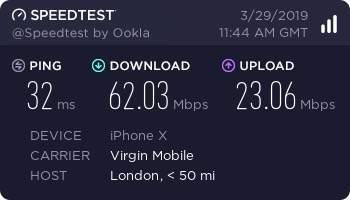 Here’s a speed test I did on Virgin Mobile last week. I know it’s area dependant, so depending on your area.. you can decide whether this is for you or not! It certainly is for me! Especially as it’s the only MVNO to offer free London Underground WiFi and many more other hotspots. I think £10 for 10gb is an amazing value at this price range. You usually don’t get £1/gb unless you pay slightly more per month. Same as my wife. No change in price and still cheap. Virgin no worse than anyone else. Customer service is not great. If your already a sim only customer can u switch to this ? It depends where you live. I live Nottingham and found ID signal extremely poor, especially indoors. They do have good offers on though. My brother just switched to this plan. He was already with VM on a 30 days rolling contract paying £8.26 a month for 4gb data with only 1gb rollover every month so this £10 plan is great. He switched to this in about 5 minutes via 789. Nice and easy! Many thanks OP! I managed to get an additional £2 loyalty discount for this. Works out as £8 for 10gb! Please note: Lifetime with a set of dates to 2099, doesn`t mean forever. I just moved to this deal a few days ago, with £33 TCB cashback, making it effectively £7.25/month over the next year. So, I probably won't stay on this deal once the 12 months are over, since there will probably be other deals available then with new cashback (unless Virgin offer a good retention deal). On a side note, the reason I moved was because I was on the same contract on 3 for six years and they recently told me I couldn't stay on it any longer (none of their retention deals beat this). 3 had wifi calling which I will miss. Also, Virgin don't allow conditional forwarding, meaning you can't set up a third-party voicemail service like Hullomail which I used on 3. Still, it has advantages; I've already noticed better signal and faster speeds, and the free wifi hotspots should come in very handy. I just moved to this deal a few days ago, with £33 TCB cashback, making it …I just moved to this deal a few days ago, with £33 TCB cashback, making it effectively £7.25/month over the next year. So, I probably won't stay on this deal once the 12 months are over, since there will probably be other deals available then with new cashback (unless Virgin offer a good retention deal).On a side note, the reason I moved was because I was on the same contract on 3 for six years and they recently told me I couldn't stay on it any longer (none of their retention deals beat this). 3 had wifi calling which I will miss. Also, Virgin don't allow conditional forwarding, meaning you can't set up a third-party voicemail service like Hullomail which I used on 3. Still, it has advantages; I've already noticed better signal and faster speeds, and the free wifi hotspots should come in very handy. Where did you get the cashback from which site? thanks so much. im on an existing sim only deal with virgin mobile and the contract has increased. will I still be eligible for cashback?i guess not as ill be phoning them?? thanks so much. im on an existing sim only deal with virgin mobile and the …thanks so much. im on an existing sim only deal with virgin mobile and the contract has increased. will I still be eligible for cashback?i guess not as ill be phoning them?? You certainly can't get the cashback if you do it by phone, you have to do it by clicking through the link on the topcashback website. It says 'Cashback will only be paid on New Contracts and not Upgrades'. That said, you may still be able to get the cashback by applying for the contract as a new contract on the website. It doesn't say you can't already be a Virgin customer. The thing is, to keep your number, you would presumably need to get the PAC from your old sim and submit it for the new one, but I don't know if this is allowed as both are the same network (has anyone here tried something like this?). If I were you though, I would call up, and explain this deal to them (including the cashback available), and ask them for an equivalent deal as an upgrade. I don't have any experience with Virgin retentions, but I would think they could offer as good a deal to keep you from leaving. You certainly can't get the cashback if you do it by phone, you have to do …You certainly can't get the cashback if you do it by phone, you have to do it by clicking through the link on the topcashback website. It says 'Cashback will only be paid on New Contracts and not Upgrades'. That said, you may still be able to get the cashback by applying for the contract as a new contract on the website. It doesn't say you can't already be a Virgin customer.The thing is, to keep your number, you would presumably need to get the PAC from your old sim and submit it for the new one, but I don't know if this is allowed as both are the same network (has anyone here tried something like this? ).If I were you though, I would call up, and explain this deal to them (including the cashback available), and ask them for an equivalent deal as an upgrade. I don't have any experience with Virgin retentions, but I would think they could offer as good a deal to keep you from leaving. Hey. I am on virgin monthly contract which is expiring next week. 789 call said this package is for £16. Is that what was said to the brother as well but later he got discount in the bill confirmation or did 789 call say this package is £10 for him? Hey. I am on virgin monthly contract which is expiring next week. 789 call …Hey. I am on virgin monthly contract which is expiring next week. 789 call said this package is for £16. Is that what was said to the brother as well but later he got discount in the bill confirmation or did 789 call say this package is £10 for him? Here’s a speed test I did on Virgin Mobile last week. I know it’s area dep …Here’s a speed test I did on Virgin Mobile last week. I know it’s area dependant, so depending on your area.. you can decide whether this is for you or not! It certainly is for me! Especially as it’s the only MVNO to offer free London Underground WiFi and many more other hotspots. [Image] I think £10 for 10gb is an amazing value at this price range. You usually don’t get £1/gb unless you pay slightly more per month. I managed to get an additional £2 loyalty discount for this. Works out as …I managed to get an additional £2 loyalty discount for this. Works out as £8 for 10gb!